This is a list of glitches in the Nintendo 3DS remake Mario & Luigi: Superstar Saga + Bowser's Minions. For glitches found in the original Game Boy Advance game, see List of Mario & Luigi: Superstar Saga glitches. NOTE: All glitch names are unofficial unless otherwise stated. The Double Glurp glitch in effect. Note how Mario can choose to attack one of the two Glurps occupying the same space. In a battle with two Glurps and a Scaratroopea, if both Glurps clone themselves after the Scaratroopea loses its wings, the clones will overlap each other in the same space due to the other space now being occupied by the Elite Troopea. If the player flees a battle, remains touching the enemy, and initiates a Luigi Dunk at the same moment the enemy finishes blinking, the battle will begin with Mario's hammer in the air. 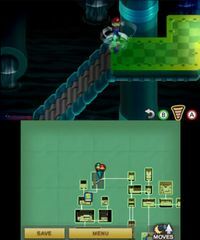 If the player flees again, Mario will remain in the back regardless of what command is selected, and can use Luigi's commands with various odd results. Entering a Green Pipe while this glitch is in effect will disable all action commands. The game will softlock if either Mario or Luigi hits a Recovery Block. Mario and Luigi clipping through the stairs. If the player performs a Spin Jump from a certain position on some slanted surfaces or stairs, Mario and Luigi will clip out of bounds and be sent offscreen, at which point they cannot get back in bounds. The only way to fix this is to reset the game. If the player saves after performing the glitch, the save file will be bricked, and they will not be able to progress any further. If the player defeats three Magikoopas at the same time, the music immediately stops until the battle victory screen. After certain cutscenes in Chateau de Chucklehuck, such as after the Popple and Rookie fight or after the Mini-Mario/Luigi Dunk tutorial, the faster Chucklehuck Woods music plays when control is regained. It is corrected when another room is entered. This page was last edited on January 19, 2019, at 23:12.